Money in the Garage: Money in the Library ! We all have our first time with eBay, that "let me try one" posting that you do for fun in hopes of making some cash. Sort of a fishing expedition-you don't know if you'll catch something but why not throw the line out there and see what happens? For me it was over ten years ago. I began hearing stories from family and friends about people who were making nice side money selling stuff on eBay. Not just the hard-to-find stuff, but things anyone could could come across. I remember a buddy telling me his daughter had bought a bunch of Dale Earnhardt T-shirts at a local Wal Mart on clearance. She paid a dollar for each and turned around and sold them for twenty dollars a piece on eBay. Around this same time, my wife had opened an eBay account and sold some of the kid's Beanie Babies. She made some nice change and got some clutter out of the house. Those were the dawning days of eBay, a brave new world where anyone could make some quick money just sitting at the computer. One of my first eye-opening auctions was the Model A Ford service manual seen here. This is a compendium of re-printed monthly Model A Ford service bulletins from back in the 1930's. 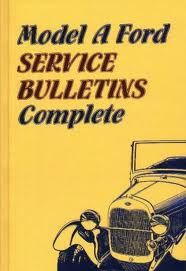 Still in use today, the monthly service bulletins were sent out by car companies to their local dealerships instructing how to diagnose mechanical problems and make repairs. Model A Ford car collectors love these manuals. I was familiar with this obscure manual because my brother once attempted a restoration of a Model A Ford. He had a copy of this manual and I remember thumbing through it, fascinated by the neat old 1930's diagrams and photos. Fast forward twenty years and I am at the local library with my kids. The library had a "books for sale" shelf in the lobby where I found a copy of the Ford Service manual. Remembering my brother's copy, I bought the book just for fun. It set me back a whole quarter! A few weeks later, I did an eBay search on my book and learned that my manual was a hot collectible. As a newbie, I decided this would be a good starting off point for me to try eBay. I awkwardly created an auction and posted my quarter book for the world to bid on. At the end of the auction I became a true believer in the power of eBay; my library find sold for $75 cash dollars! Needless to say, I was hooked and the auctions have been coming ever since. When sharing eBay stories with family and friends, my brother always throws in... "Tell them about that Model A book!" So I recite that early story and my brother always adds, "Man, I should have kept my copy!" You may think that specialty books require some unique niche-type knowledge on your part. While that always helps, much of your buying decisions can be good common sense reasoning. Books such as high school yearbooks, car manuals, military related guides are all specialty niche books. One basic rule of thumb that helps me decide if the book may be collectible is this: can you find it at the big box retail bookstore? If you can't, then then it may be worth buying and flipping on eBay. Other issues should be considered as well. For example, is it a subject that collectors, history buffs or hobbyist would be interested in? When looking at books for sale in the library, I have even logged onto a library computer and looked them up right there on the spot! Even if you are still not sure of a book's value, with most used books costing a dollar or less, what have you got to lose? (Nowadays, the Ford Service manuals sell on eBay for around $35. Less then the old days but still good money if you paid only a quarter) If you know of any "hot" books that bring in big cash dollars on eBay send me a comment to pass along.